Hubby loves pickles! I mean he reallllllllllllllllllllllly loooooooooooooooves pickles. Unfortunately I am deathly allergic to mustard and just don’t make them enough for him because of my allergy. But, the other day we ran across some awesome pickling cucumbers at the local farmers market produce and he begged (really, he did) so I gave in and made my super secret Garlic Dill Pickles for him. Now I’m going to share them with you. Chill the cucumbers in a bowl of ice water for 30 minutes or more. In a medium non-reactive pan heat the water, vinegar and salt over a medium high heat until the salt is dissolved. Set aside to cool. Cut cucumbers to desired size. Place cucumbers in large jar. Stir garlic, dill and mustard seed into vinegar mix. Pour cooled mixture over pickles. Place whole onion on top to weight pickles to keep them submerged. 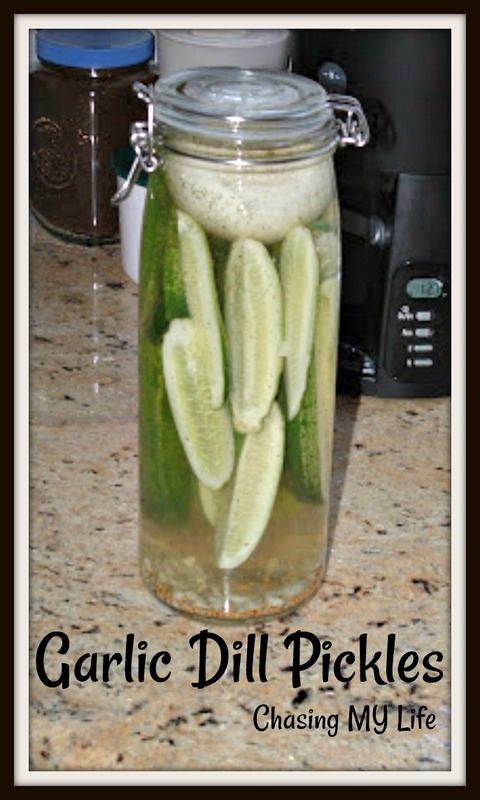 Set in a cool place for 3-4 days at room temperature and then move to refrigerator for crisp pickles. *you can use dehydrated, but I prefer not to when at all possible – fresh gives such a better flavor!